Plans for the Good Shepherd Institute in Lindsborg, Kansas. Rendering by MASS Design Group. Few people recognize the interconnectedness of architecture, social justice, and local food systems; Caitlin Taylor is dedicated to changing that. Between roles as an architect with nonprofit firm MASS Design Group, an adjunct professor of architecture at Columbia University, and a founding member of Four Root Farm in rural Connecticut, she is living her dream of uniting food systems and architecture in her life and work. Within a growing movement of architects working in public interest design through a framework of intersectionality, MASS (Model of Architecture Serving Society) is pioneering participatory community design processes to promote sustainable, robust local economies, human dignity, and social justice work through the built environment. The firm recognizes that physical infrastructure plays a fundamental role in communicating social justice narratives and promoting systemic changes in culture and economy. Architects and planners designed the factory farms that house chickens, the city layouts that continue to segregate populations, the highways that define the relationship between cities, suburbia, and the surrounding farmland. “Architecture is never neutral. It either heals or hurts,” MASS states boldly at the top of its website, and the firm is dedicated to work that first seeks to listen and understand, and then to heal the injustices that have been etched in bricks, pavement, and economic systems over the centuries. In the past year, with Caitlin’s help, MASS has expanded this work to include design centered on food justice, food systems, and agriculture. Through two new initiatives — the Hudson Valley Design Lab in Poughkeepsie, New York, and the Good Shepherd Institute in Lindsborg, Kansas — the Good Shepherd Institute in Lindsborg, Kansas, Caitlin shared with us her perspectives on revitalizing food systems through community-centered design. Poughkeepsie, a city of 30,000 people on the Hudson River 80 miles north of New York City, is a striking case study of the influence of transportation planning on local economies. In the late 1950s, as car-centric culture was sweeping the nation, the city poured urban renewal funds into reshaping its layout to protect its thriving downtown center from suburban traffic. To maintain the central Main Mall as a pedestrian-only zone, urban planners designed it as a car-free area with parking lots on the periphery and large arterial roads cutting through the city on either side — demolishing many of the city’s buildings in the process. This design isolated the city center, affirmed vehicle access as the primary force shaping the city’s landscape, and perpetuated racial and economic inequalities. 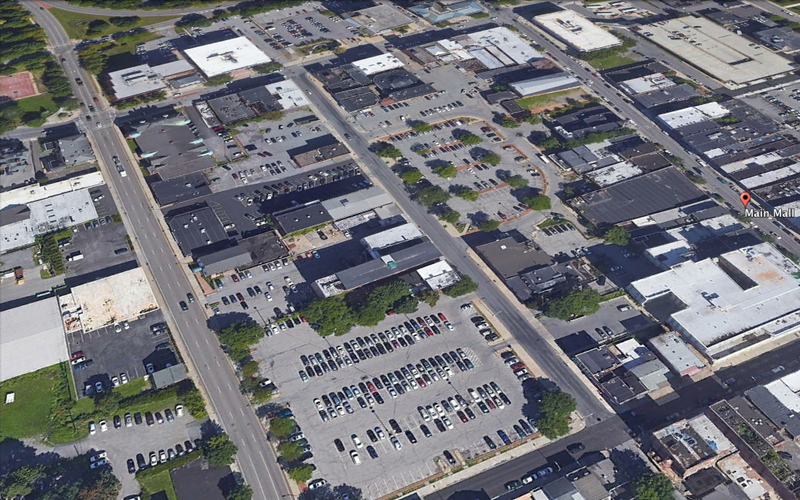 The Main Mall (left), and the parking lots and arterial roads that surround it (right). This Architect Magazine article about Poughkeepsie and the Hudson Valley Design Lab further details the path that led to the city’s current layout. Photos by Alexius Horatius on Wikimedia Commons, and Google Earth. 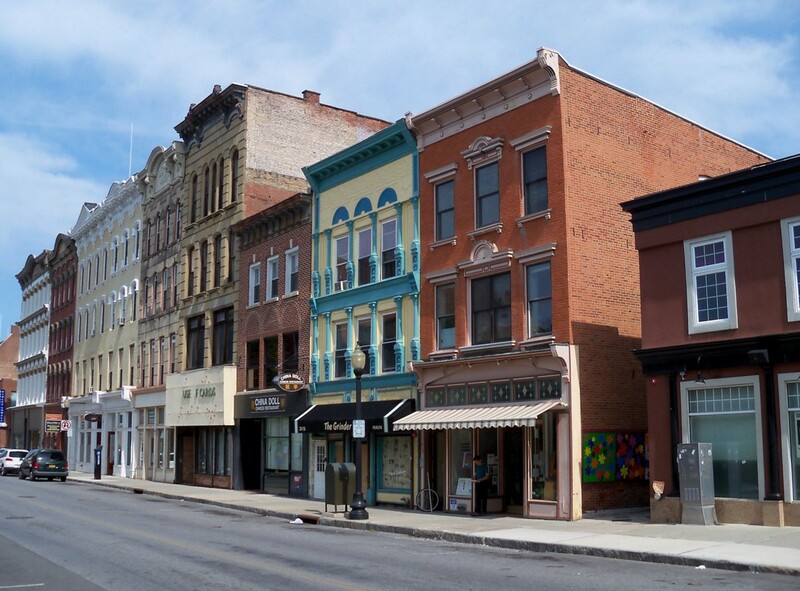 Alongside other organizations and urban planners throughout the city, MASS (through its Hudson Valley Design Lab) is contributing its expertise in participatory design to the revitalization of Poughkeepsie’s downtown area and local economy. As with all of MASS’s work, Caitlin explains, the HVDL’s work is characterized by “an intense focus on early phase design work and making sure the right voices are at the table,” especially voices of marginalized community members that are seldom heard in planning processes. In Poughkeepsie, HVDL’s storefront office serves as a community meeting space for mapping the region’s assets and liabilities, envisioning new opportunities and spaces for the city, and building partnerships to manifest that vision. Chris Kroner, a MASS Principal and architect, runs the Hudson Valley Design Lab, with MASS Executive Director Michael Murphy, a Poughkeepsie native, Justin Brown, a MASS Principal based in Boston, and Caitlin, who lives on her farm in Connecticut and is in Poughkeepsie with the team at least once a week. As adjunct professors at the Columbia University Graduate School of Architecture, Planning, and Preservation (GSAPP), Caitlin, Michael, and Chris engage students in research projects analyzing the region’s food infrastructure, among other systems, and envisioning new and interesting relationships between parts of the economy. The newly formed Hudson Valley Initiative at GSAPP increases awareness of the Hudson Valley’s regional economic and cultural landscapes, and invests the students’ energy and talent in the region, while educating them in the art of bottom-up community design work at a local scale. The HVDL storefront in downtown Poughkeepsie. Photo by MASS Design Group. One level of the HVDL’s work in strengthening local economies involves weaving together organizations, students, residents, and community leaders throughout the area to envision new and creative partnerships. Ongoing projects include the programming and activation of a decommissioned cistern, the redesign of a historic trolley barn into a community arts space, and the reimagining of a forgotten piece of industrial creek infrastructure that weaves through the city. One particularly integrative and ambitious project is the creation of a 30,000 square-foot food hub in the city center. Located in two repurposed buildings on a corner of a main arterial road, the center will house a co-working space, residential units, and a food hall with vendors and a teaching kitchen. Poughkeepsie’s urban economy is surprisingly isolated from the farmland beyond the city; Caitlin is especially passionate about the food hub project as a means of creating economic relationships between city residents and nearby farmers. Farmland in Dutchess County, near Poughkeepsie. Photo by Daniel Case on Wikimedia Commons. “The Hudson Valley is an agriculturally rich landscape,” she explains, “but products don’t often make it into Poughkeepsie.” The food hall will feature locally-grown produce from the Hudson Valley, with a goal of “helping to manage, heal, and build a vibrant new culinary culture.” Beyond the goals of more food access in urban areas and more markets for rural farmers, the design process for the food hall emphasizes cultural exchange between urban and rural communities, leading to increased communication and interdependence between different parts of the Hudson Valley. The Good Shepherd Poultry Ranch and surrounding fields in Lindsborg, Kansas, from Google Earth. Architecture is in practice a largely urban-centric profession. Rural communities would benefit from more attention from professional designers than they regularly receive. 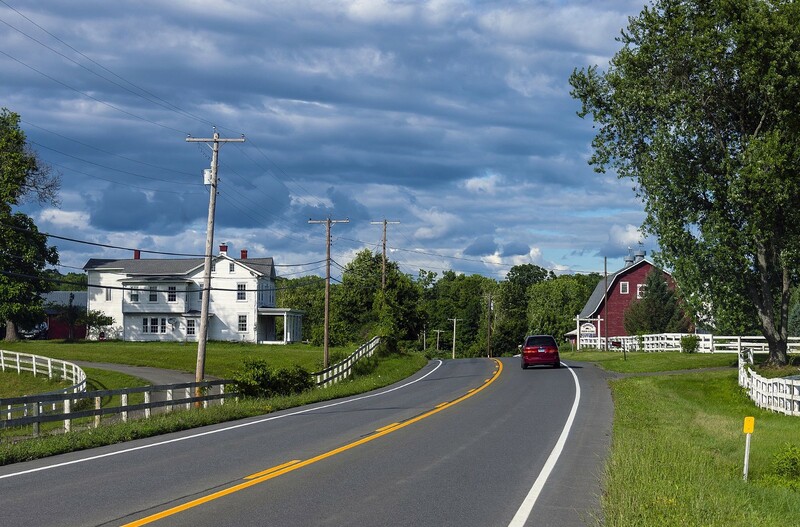 Understanding the needs of rural communities, which are usually very specific to their local landscapes and economies, takes time and care — and there are few economic incentives to do so within mainstream profit-oriented systems. Yet “honoring rural communities is a vital issue of economic, social, and environmental justice,” Caitlin emphasizes. As a nonprofit architecture firm with a breadth of experiences designing mission-driven facilities worldwide, MASS is poised to change this narrative. Their work includes improving access to resources for citizens, countering misleading narratives about rural culture perpetuated by urban-centered political systems and media, and recognizing that rural areas are the country’s primary food producers — and therefore that empowered rural communities are key change agents in reshaping food production systems. At present, 99.9% of meat chickens and 97% of laying hens are raised on factory farms — energy- and resource-intensive centers that pollute the landscapes and homogenize the cultures of rural communities. The factory-farmed meat industry, in particular, has received a lot of media attention in recent years, exposing the ecological and animal welfare nightmares of the status quo. 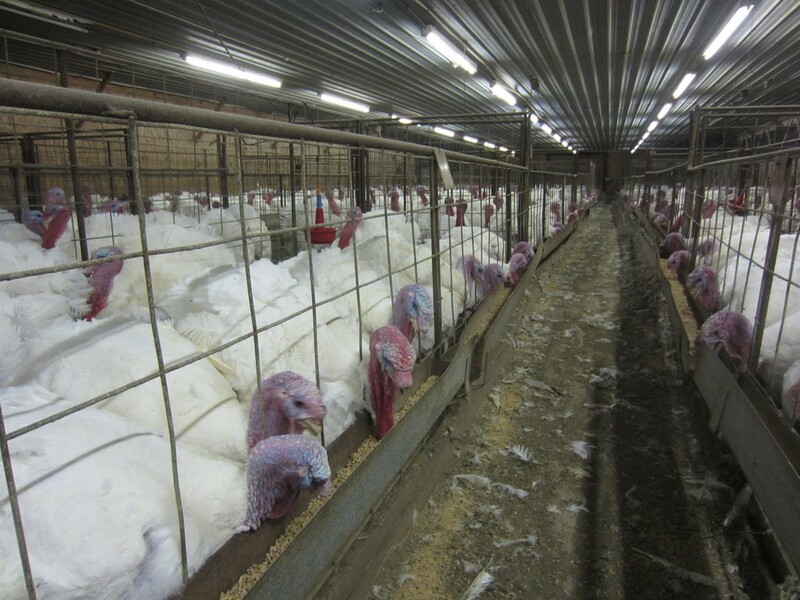 99% of turkeys raised in the USA live in overcrowded factory farms (left). The Good Shepherd Poultry Ranch works with heritage breeds and free-range practices for healthier animals, people, and land (right). Photos by Mercy for Animals on Wikimedia Commons (left) and Jim Richardson (right). Nonetheless, poultry continues to be a staple of American diets — and redesigning local economies around poultry production, Caitlin notes, is an essential part of building resilient agricultural systems. In February 2018, MASS partnered with poultry farmer Frank Reese, owner of the Good Shepherd Poultry Ranch in Lindsborg, Kansas, to put into practice his vision for changing the face of poultry production in America through the Good Shepherd Institute. The 160-acre Good Shepherd Poultry Ranch breeds and raises heritage chickens, turkeys, ducks, and geese, with great care given to environmental stewardship and animal welfare. Frank’s passion is raising awareness of the value of hardy and self-reliant heritage breeds in transitioning America’s poultry industry to small, sustainable farms. A fourth-generation Kansan poultry farmer and a nationally recognized expert in poultry breeding and traditional husbandry, Frank has brought several endangered breeds back from the brink of extinction. Frank Reese with his turkeys. Photo by Jim Richardson. With support from MASS, EJF Philanthropies, and Heritage Foods — a national network of prominent chefs and restaurants and the team behind the recent film Eating Animals (Big Star Films) — Frank plans to transform his farm into a conservation center and teaching space. Called the Good Shepherd Institute, it will be dedicated to conserving the biodiversity of poultry breeds, sharing Frank’s extensive knowledge of agroecological poultry farming, and engaging farmers and stakeholders throughout the food system. 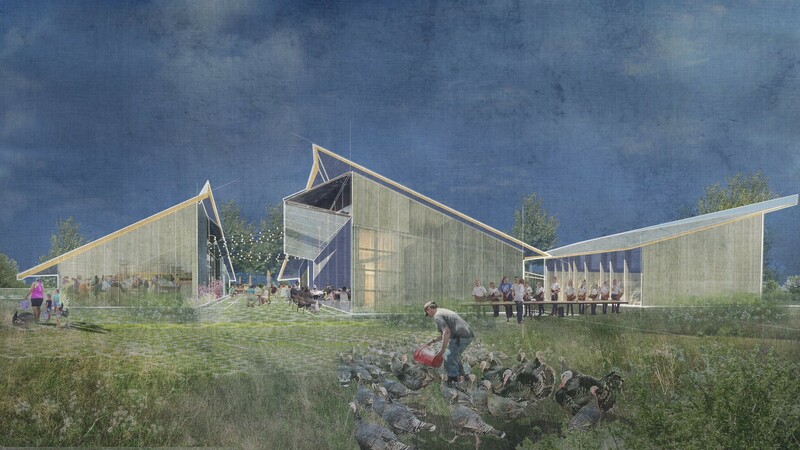 MASS has developed preliminary designs for a library, a visitor’s center, experiment stations, classrooms, a teaching kitchen and restaurant, and a mosaic of agroecological fields to feed the flocks. 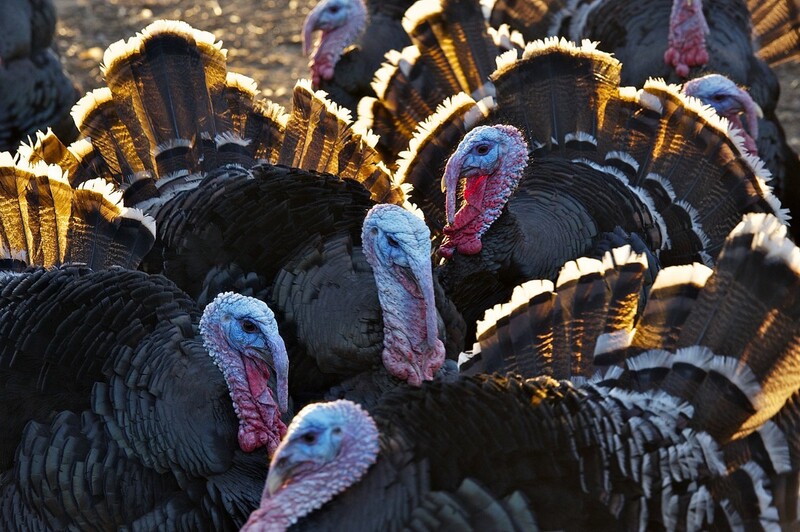 By spreading awareness of small-scale poultry farming practices, the team hopes that the institute will become a catalyst for actively rebuilding rural infrastructure around local, sustainable food systems, and will increase economic opportunities for farmers by strengthening the market for heritage birds. 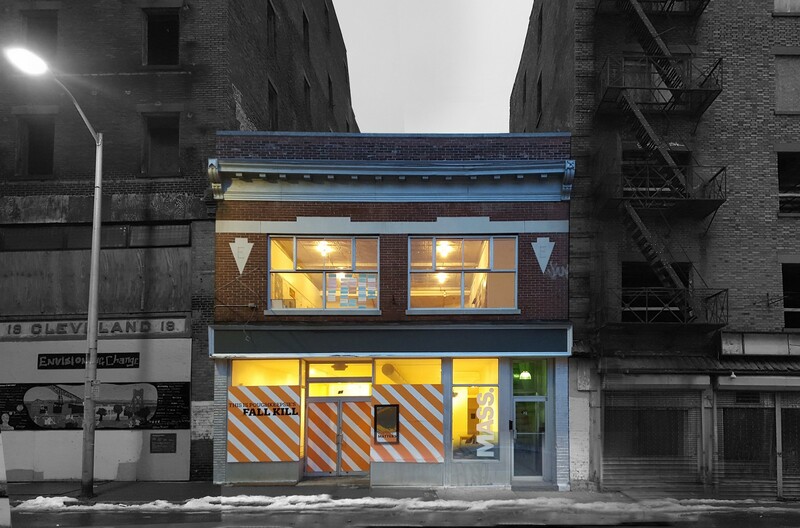 As with the food hall project, profitability is an important metric of the project’s success. Frank currently holds a day job as a nurse anesthetist to economically support the farm as the market for sustainably-raised heritage birds is not yet well-developed. Creating a new economic system to support Frank and other farmers is at the heart of Good Shepherd’s visioning and design process. Rendering by MASS Design Group. Read about other local food systems and food justice initiatives from around the world on our Planet Local: Food page. Learn more about the role of architecture in human dignity and social justice by watching MASS co-founder Michael Murphy’s TED Talk, Architecture that’s Built to Heal, and MASS’s Beyond the Building video series. Article written by Carly Gayle.